BREAKING: Judge Patrick McCabe issues a court order for Sissy Roberts barring Tim Baudier from mailing more fliers on Robert’s place in the Jefferson Parish organized crime family. 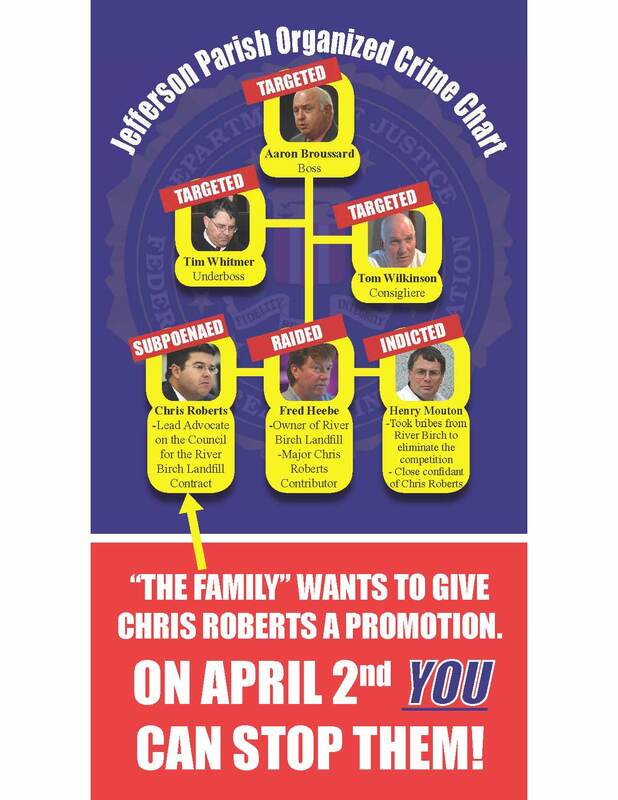 Author Posted on March 24, 2011 Categories SopTags Jefferson Parish Councilman Chris Roberts, Tim Baudier43 Comments on BREAKING: Judge Patrick McCabe issues a court order for Sissy Roberts barring Tim Baudier from mailing more fliers on Robert’s place in the Jefferson Parish organized crime family. Our about page is again receiving a workout, here is a supplement. Author Posted on March 24, 2011 Categories SopTags Slabbed3 Comments on Our about page is again receiving a workout, here is a supplement. Girod Jackson? Oh yeah we know him well. IMHO he is cut from the same cloth as Byron Lee, Derrick Sheperd, Cedric Richmond and that clique of corrupt politicians. Fertile ground for certain Lee though following Girod and the money will probably lead you back to Team Ward/Heebe. How funny that a guy who can’t seem to build a house is able to score big time no bid contracts from the Parish after Katrina. You can thank me later Lee. Career politicians are not born, they are excreted: A Sissy Roberts truth hurts update. Author Posted on March 24, 2011 Categories SopTags Gretna Style, Jefferson Parish Councilman Chris Roberts, Jefferson Parish Political Corruption Scandal8 Comments on Career politicians are not born, they are excreted: A Sissy Roberts truth hurts update. Team River Birch beclowns their clowns: A putting in the fix on the inside for River Birch update. Author Posted on March 24, 2011 Categories SopTags Deputy Parish Attorney Louis Gruntz, Glenn Smith, Jefferson Parish Councilman Tom Capella, Jefferson Parish Human Resources Director Peggy Barton, Jefferson Parish Political Corruption Scandal, Jefferson Parish President John Young, Loren C Scott, Marnie Winter, Parish Attorney Deborah Foshee, Public Records Request, Rick Buller, River Birch Landfill, Transparent Government6 Comments on Team River Birch beclowns their clowns: A putting in the fix on the inside for River Birch update.